for you to use in your life and Mission as you prepare for Christmas. 1 A Church Service to stimulate some interaction - at least in the individual brain! 2 A Youth Group leaflet - makes a change from a Snowman or Father Christmas type images. 3 A Youth Group session which I am focusing on here - just some ideas. Give all your group a copy - it is more personal that an image on a projector screen. Ask an opening easy question. ice-breaker before deeper things ahead. often it will be a human they came with! 1 Which Bob is most sad and which is one most happy- and why? 2 Which Blob is having a good time but only superficially - what tells you this? Split the group up into three's so that everyone is mixed up - do this between every question from now on - to enable the group to get used to change. 3 Which of the Blob scenarios reminds you of your earliest memory of Christmas? 4 Which scenario reminds you of your last Christmas? 5 Which Blob, or Blobs, reminds you of your worst Christmas? 6 Do you follow the flow at Christmas - just follow the crowd, do what your family traditionally do, or your friends do? Pick a few of the Blobs to describe? 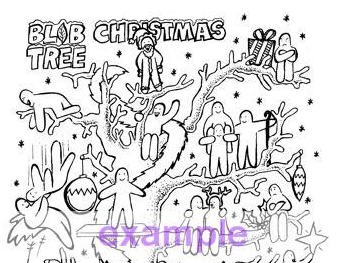 8 If you are a human with a faith in God - and trying to live it out - which of these Blobs describes how you would want to live your Christmas life? 9 Look carefully at all the individual Blobs. Which one is in most emotional pain? Put a word to that feeling? Who do you know who feels the same or similar feelings? 11 End with sharing a big tin of Christmas sweets and after all have chosen a sweet - ask everyone to say why they picked that colour and type of chocolate? Does their choice match their personality and character? ....... a fun way to end. Last comment ................ these are just ideas. Use your imagination to think of questions which are appropriate for your group - you are expert in you context. But - I recommend going for stretch - outside the comfort zones.